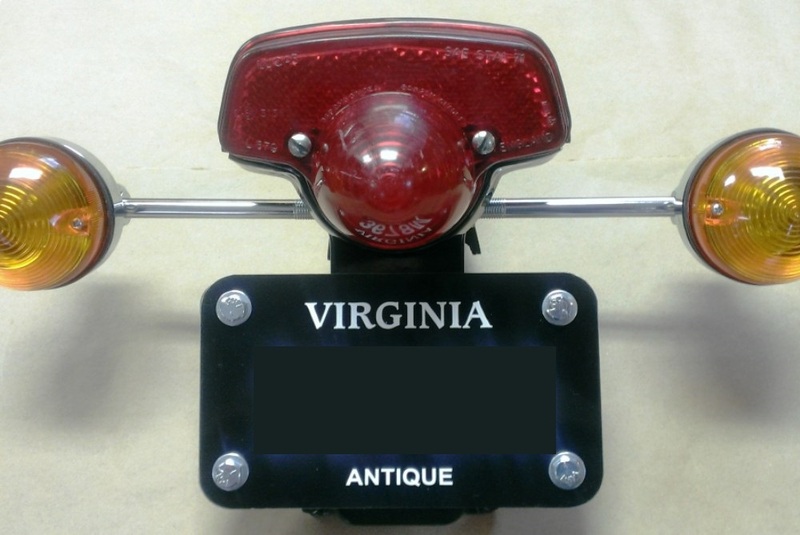 The 1971/72 Norton Commando tail light assembly has no mounting suitable for a US license plate. We produce brackets to correct this. These are designed by us, manufactured in New Jersey, USA, and finished by us. Raw: $25.00 Blasted: $30.00 Black Powder Coat $35 Chrome Powder Coat: $37.50 We also list these on eBay, but like everything else we sell, they cost more there. Here they are in raw steel as they came from the machine shop. Notice the surface rust on the edges and slight marks on the faces. Here they are in raw steel but media blasted. The rust is gone and the surface is much smoother. They might rust again in shipping but it would be minor. If you want to paint them yourself, this is probably the best version for you. Here they are after we've powder coated them in gloss black. This is how we use them. Here they are after we've powder coated them in chrome. The chrome powder coat looks good but should be thought of as similar to chrome, not as real chrome.